Assume the receptor is fixed and consider the space of rotations of the ligand with respect to the receptor. This space, denoted by , can be specified by . We can represent this space as a subset of the 9-dimensional (9D) Euclidean space that satisfies the constraints and ; to optimize a function on this space we can add the constraints to the function via Lagrange multipliers and end up with an optimization problem on a 9D Euclidean space to which Euclidean optimization algorithms are directly applicable. Therefore, we end up with a 9D search space by fully disregarding the geometry of the original search space, namely . By contrast, in a manifold optimization approach, we fully take into account that is a curved space, i.e., a nonlinear manifold of dimension 3 (3D). To develop optimization algorithms, we need local parameterizations of the manifold, of which many are available. A local parametrization corresponds to a local flattening/straightening of the manifold, a local deformation of the manifold to arrive at a subset of a Euclidean space. A desirable deformation is one that, informally speaking, deforms/scales the rotational angles similarly and does not distort the relationship between rotational angles. Think of a “reverse process” of looking at a curved mirror that distorts your image: some mirrors drastically distort the image producing an unrecognizable figure and some respect the original proportions and reflect some of the essential characteristics of the figure. The exponential coordinates parametrization that locally maps the Euclidean tangent space onto the nonlinear manifold, is a parametrization of the latter kind, i.e., one that reflects essential features of the rotational movement. In this sense, it is a natural parametrization that contributes to the efficiency of local optimization algorithms and has been essential for our characterization of the funnels of the free-energy landscape. For optimization on the rotational space , the search space of manifold optimization has a significantly lower 3D search space compared to the alternative we described above, however, we no longer can directly use the tried and tested Euclidean optimization algorithms in this case. 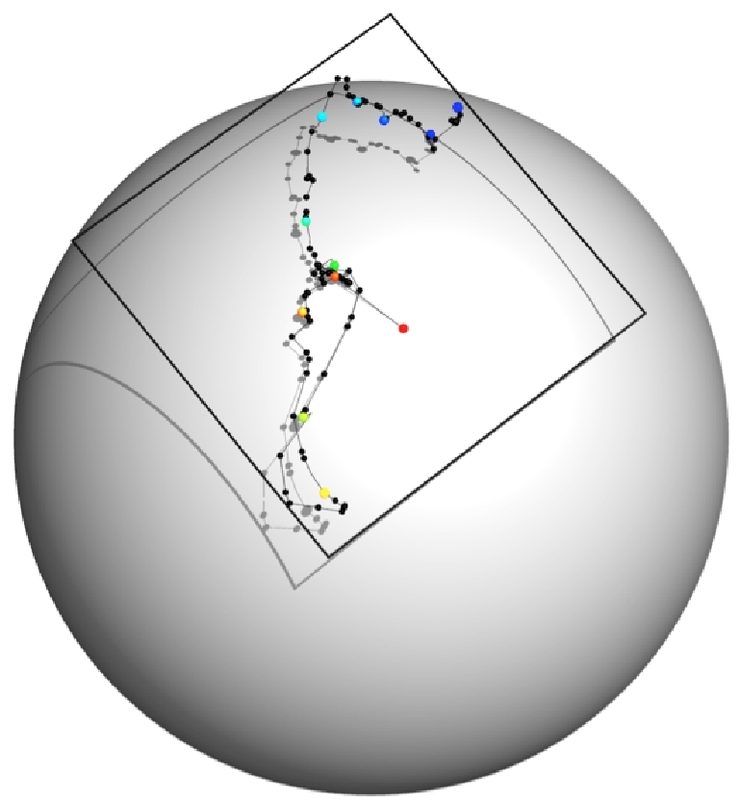 For , this is not a serious drawback as efficient manifold optimization algorithms for this purpose exist, but for the more general problem of optimization on non-linear manifolds, developing effective algorithms is an issue that needs serious consideration and is the subject of active research.